This Thanksgiving, we went to visit family in Michigan. Since we are not together over Christmas, we elected to exchange gifts at that time. 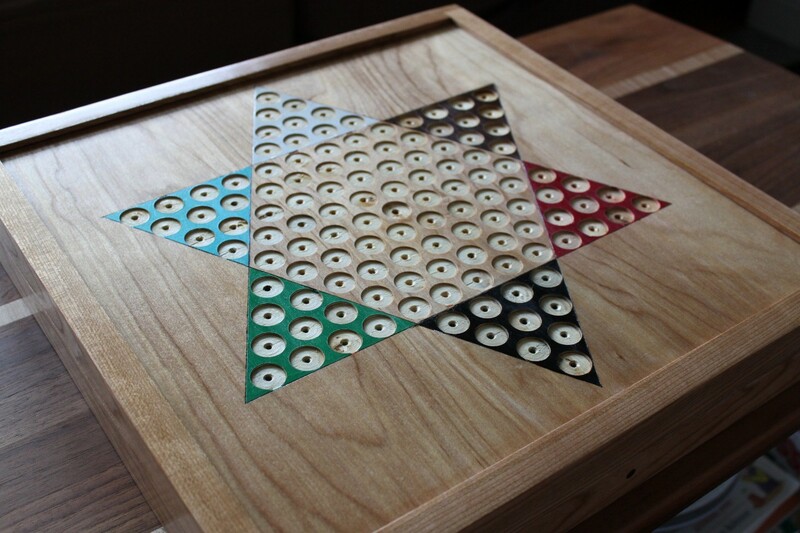 This year, my wife and I decided to make a board game, and we picked Chinese checkers. It is an easy game to play, appropriate for our youngest niece, and you can have 6 people in one game. 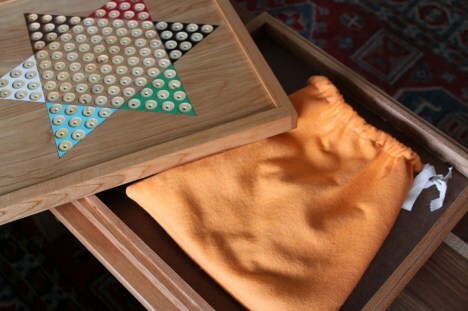 Also going into this decision is that my wife enjoys crafting with the wooden pegs that make up the playing pieces. For more information on the pieces, and close ups, you can check out her blog here. I decided to make the game board be the lid of a box that will hold the pieces when not in use. A word on my process. I usually make it up as I go along. I do sketch up a rough drawing beforehand, but I tend to adapt as I go. I find that I usually change the design quite a bit once I have a chance to look at and hold something in my hands, so please don’t look at this as a step by step guide, more as an outline of how I did this. 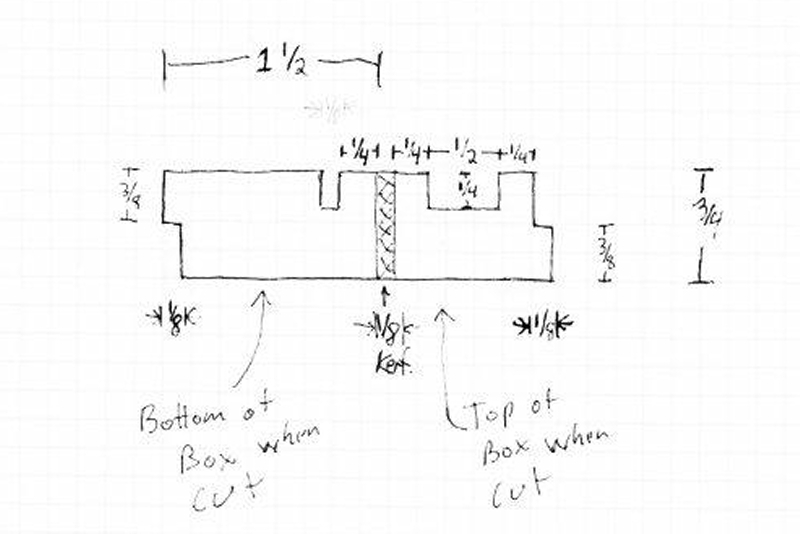 That being said, the dimensions given on the cuts for the sides of the board are accurate, except for the dado that holds the base of the box. I had to expand that slightly to fit what I had on hand, but everything else was the same. The box is made of 6 pieces. I used a 1/8 inch hard board for the bottom of the box, 4 cherry boards cut identically, and a 1/2 inch thick birch plywood board. 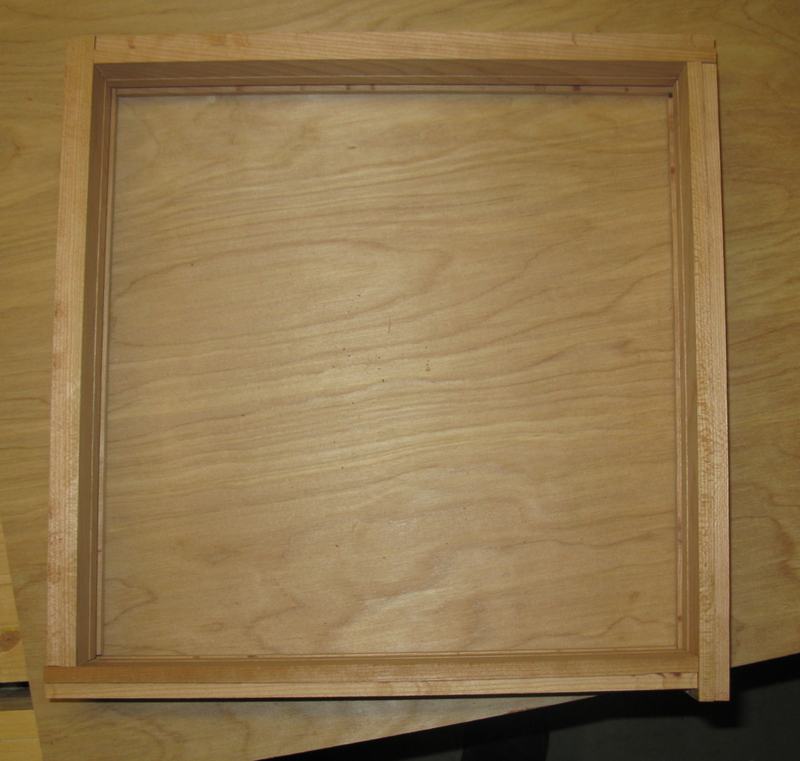 Starting with the cherry boards, I milled them to size, and then used a router table to cut the rabbets and dados. The exception was the dado for the hardboard which I cut with my table saw. Each board was cut the same way. Sorry for the blurry picture, but this gives an idea of what it looked like when I was done cutting them. 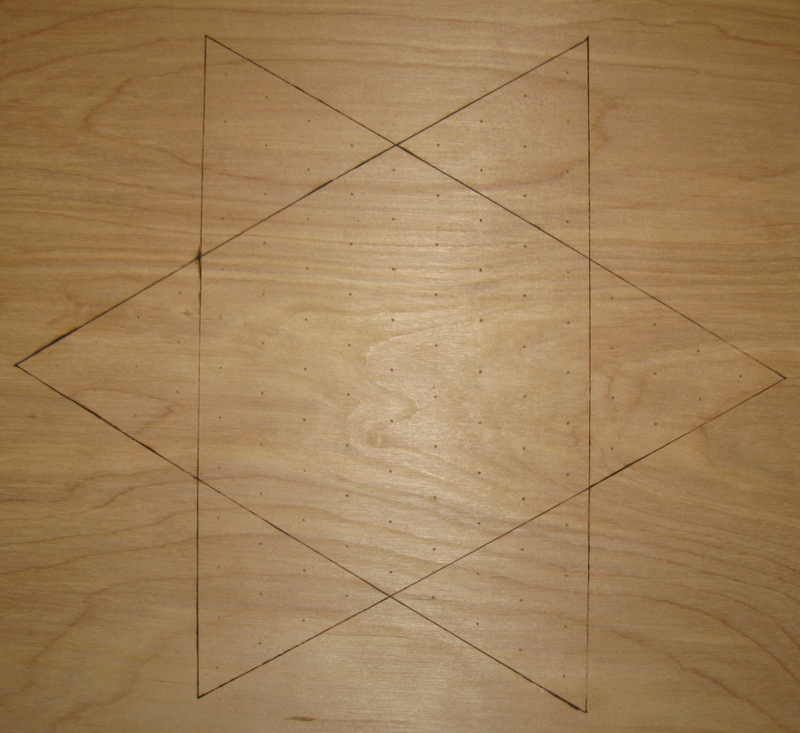 I then routed a rabbet on one end of each board to make a lap joint on each corner of the box. Please note, this just shows the alignment, the rabbets at the end of the boards had not been cut yet in this picture, so the boards are not seated like they are in the final product. After the sides were done, I cut the top and bottom to fit. I don’t have the dimensions of these boards, because, yeah, I lost that piece of paper. But, it should be pretty easy to figure out from the sides. Anyway, the next step was to get the top of the board right. I started out basing this on the playing pieces. 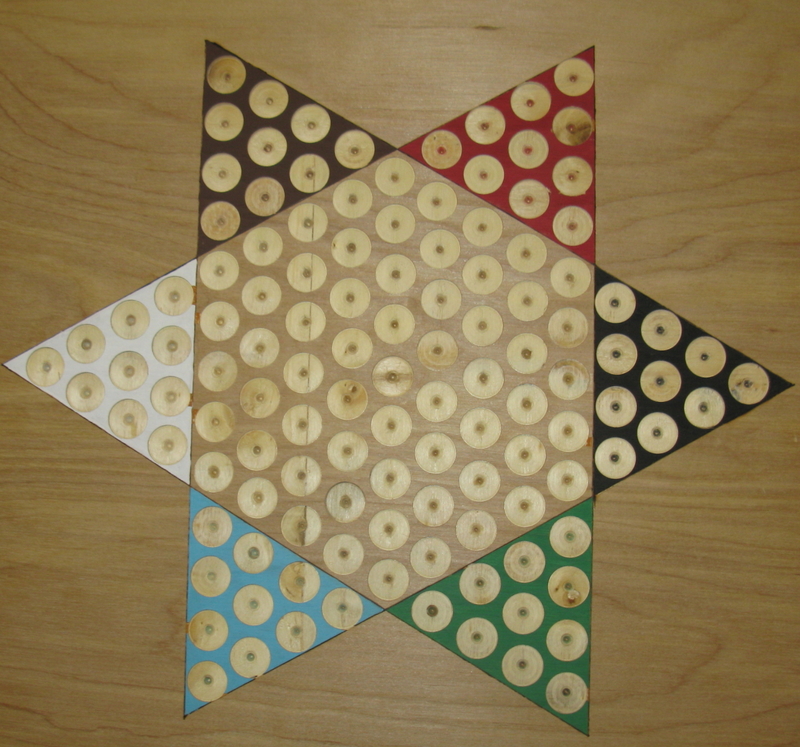 They are 5/8 inches in diameter, and I wanted 3/8 inch separation between the pieces. 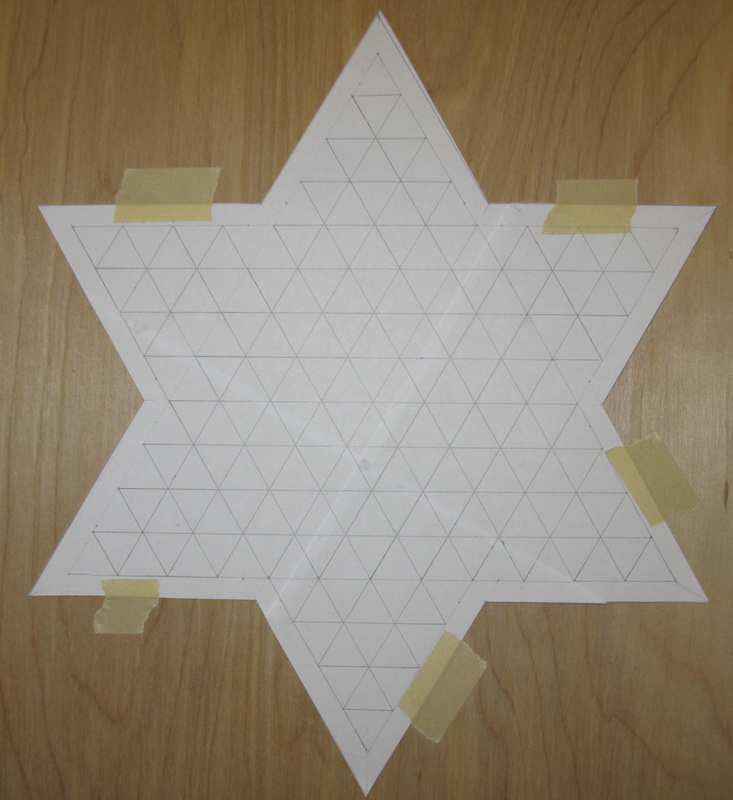 Using that dimension, I then drew the board on a piece of paper, each intersection being the center of a hole, cut it out, and using masking tape, attached it to the board. 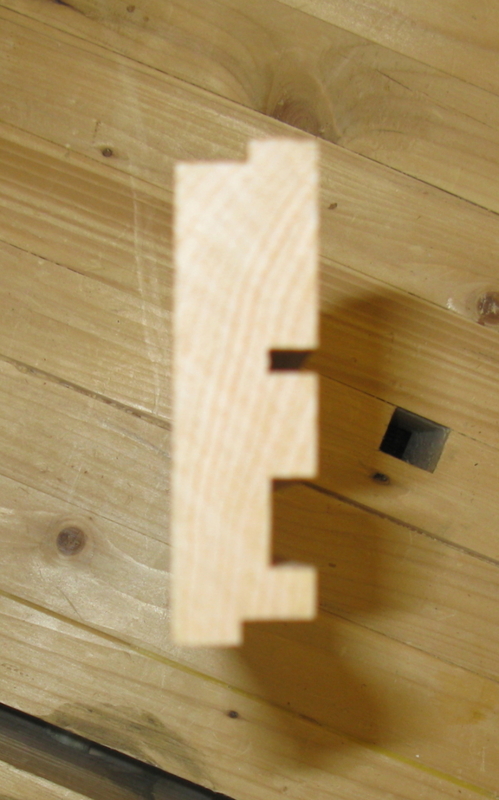 Using a nail and a hammer, I marked each intersection point for the center of each hole to be drilled by tapping a hole. I then sketched in lines with pencil outlining the sections of the board, and using a wood burning tool, I burned the lines into the board. This step helped to keep the paint from running. 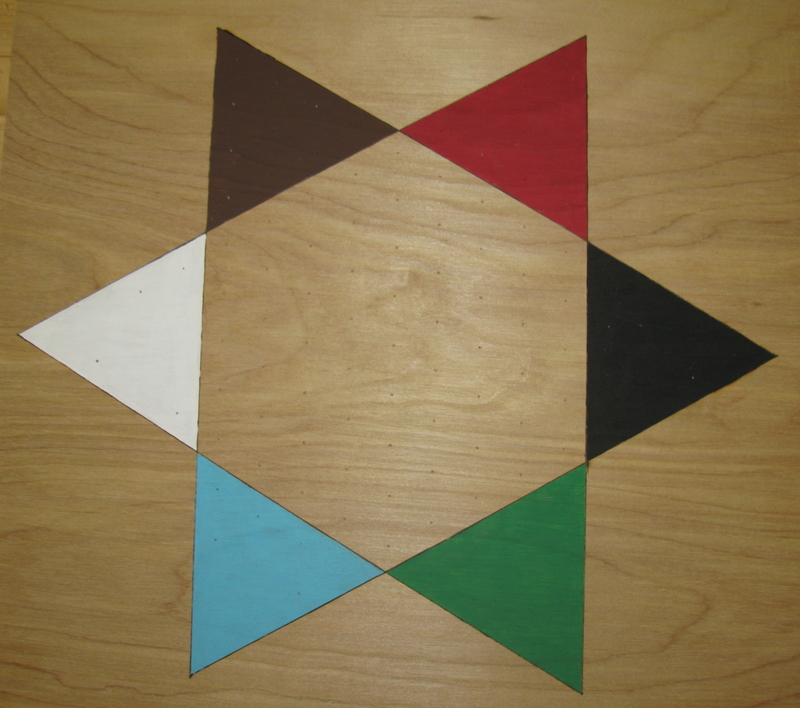 Initially I was going to stain the six points, but I was worried it would either run or smudge when getting wiped off, so I elected to go this route. 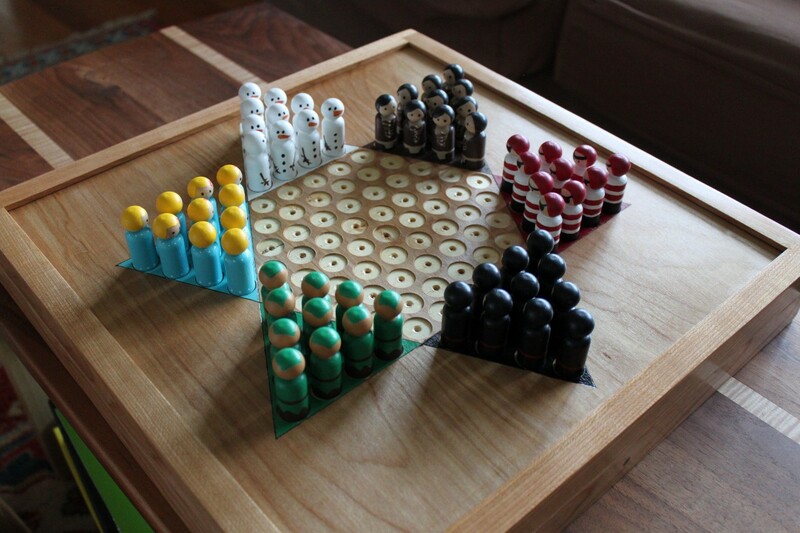 My wife then painted the board to match the main color of each set of the playing pieces. I have to give credit to my wife for this part. I hate painting..anything. Fortunately, she seems to enjoy it, so I turned this part of the project over to her. Once I got the painted board back, I just used a 11/16 Forstner bit I purchased from Rockler to cut the holes. I set up my drill press to only cut about 1/8 inch deep. As this is plywood, I was worried about how it look going too deep, and how the veneer would chip/tear, but fortunately, it was not much of an issue. I just centered the bit on each punched nail hole, and let the press do the work. Once that was done, I just slid the game board and the bottom of the box into the proper dados, glued the lap joints on the sides, and clamped it together. One thing about this that may not be intuitive is that you glue the game board facing the bottom of the hard board that makes up the bottom of the box. I hope the picture below helps make that clear. Once the box is glued together, I clamped it, let it sit overnight, then I cut completely through the sides, in the space between the game board and the bottom of the box with my table saw. Because of the rabbets cut on the sides, the now separated lid and bottom of the box nest right on each other without sliding around. Once everything was separated, it was just a matter of sanding the piece, making sure everything fit, then finishing the piece. I used shellac to give it a warm tone, and because it goes over the paint very well. My wife made a bag to hold the pieces and keep them from knocking all around the inside of the box, and we were done. I was fairly happy with the final product, but if I had to do it again, I would likely make my own board for the top, using full thickness lumber in place of the plywood. Yes, this will move with humidity, and may warp, but the holes were really not deep enough to hold the pieces securely. I did not want to cut them too deeply because of how the plywood looks under the veneer. I would give up the stability of the plywood for the deeper holes that will look better being solid wood. Also, the lack of veneer that will likely chip with time is also a bonus for the solid wood board. The way you glued it together and then separated it on the table saw is pretty clever. Listen to him…vying for a new table saw.